What opera lover wouldn’t mind spending a lazy afternoon listening to Mozart? Quite a number of them, I would gather. For my money, I could listen to either The Magic Flute, The Abduction of the Seraglio, or most indubitably Don Giovanni anytime, anywhere, come rain or come shine. In that respect, Mozart’s output is one of the most varied of the classical composers, covering the widest possible spectrum of subjects and themes in any number of permutations: from the lofty and the sublime to the comically outrageous; from the dowdy and outwardly respectable to the absurdly ridiculous and bizarre. An embarrassment of musical riches, you say? Absolutely! And hearing two such towering masterpieces as The Marriage of Figaro and Don Giovanni within a span of two months’ time puts things into greater perspective: that Salzburg-born Wolfgang Amadeus Mozart was the most Shakespearean of composers for the operatic stage. Not wanting to make too much of this premise (one I previously expanded upon in the following link: https://josmarlopes.wordpress.com/2013/09/10/the-fab-four-of-opera-mozart-verdi-wagner-puccini-part-four/), let’s just say that programming two such closely related works as those mentioned above gives radio listeners the unique opportunity for comparing and contrasting. First up is The Marriage of Figaro, in a new production by Richard Eyre (who also directed the successful Carmen and the only so-so Werther at the Met), which took the place of a previously scrapped venture by British director Michael Grandage. 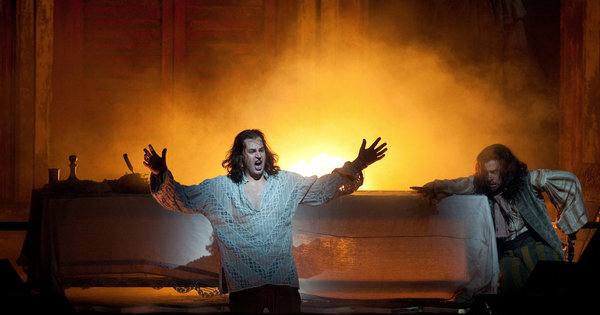 Eyre’s version was aired, so to speak, by the Metropolitan Opera on December 20, 2014. However, in the Saturday broadcast of February 21, 2015, listeners were treated to a revival of (guess who?) 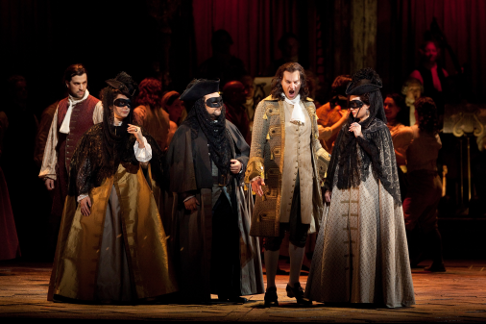 Grandage’s 2011 multi-tiered production of Don Giovanni. Interchangeable cast lists, such as those that took place at Glyndebourne and La Scala lo these many eons ago, were once considered the norm for these works (as well as for Cosi fan tutte, the third leg in the collaborative Mozart-Da Ponte triple-crown). The reason for this was plain: it was logical to keep the same group of artists for a series of productions that, in the case of Mozart or Rossini, could be carried over via a director’s ever-expanding thought processes or ideas. It’s tantamount to keeping the same direction for , say, Wagner’s Ring of the Nibelung throughout that work’s run. It makes sense from a practical as well as directorial standpoint to do so. And keeping the same, or similar, cast members associated with said productions can make matters clearer, or even sharpen the focus as it were, by maintaining that director’s vision for his or her work. We are confronted, then, with two different takes by two different directors for Figaro and Don Giovanni, where logic would seme to dictate that only one person’s vision take precedence. Throwing logic to the winds can be the result of management decisions based not on logic but on practical real-world requirements, whatever that may be. Herr Mozart was intimately familiar with real-world requirements, as he was forced to make due with the whims of the high and mighty of his day. A keen-eyed observer of all that transpired around him, Mozart learned the hard way to navigate the sometimes capricious order of things. He knew which way the political winds blew. So how was this accomplished? For one, by concentrating that enormously creative mind-set of his on the task at hand, and for another by placing his innermost feelings and ideas into the works themselves — much as the painter Francisco Goya did in Spain, at about the same period. Without getting too tangled in a jumble of my own ideas, let’s take the prime example of Figaro and Count Almaviva, in The Marriage of Figaro, and contrast them with their counterparts, Leporello and Don Giovanni. These roles are generally taken by baritones and basses (or vice versa), and are considered a mixture of the comic with the semi-serious — at times separately, at other times simultaneously — that can be interpreted in any number of ways, depending on how directors see these characters, i.e., as heroes or villains, victims or fiends. Both Figaro and Leporello are servants to powerful lords: Figaro is subservient to his master, the Count; Leporello tries to be humble, but winds up more argumentative than subservient, while letting his limited code of honor get in the way of Giovanni’s lust for women and the supposed “good life” they both lead. In the earlier work, Figaro one-ups the Count on any number of occasions, mostly by plotting against his master’s reinstatement of the doit du seigneur, or “right of the lord” to sleep with his bride-to-be, Susanna. In turn, Figaro gets one-upped by his intended, who demonstrates in action and deed that she won’t be dictated to by either husband or Count. In contrast, Leporello gets his one and only chance to act the part of his boss in a comic scene from Act II, where he dons Giovanni’s cloak and hat in an attempt at wooing the unsuspecting Donna Elvira, one of the Don’s former conquests. Leporello is soon thwarted by none other than his master, who arrives to noisily shoo the couple away. He then laconically strums a lone mandolin for his own bout of wooing. In the above examples, one gets the sense of the wily Mozart at work, plying his musical trade at Emperor Joseph II’s court, while circumnavigating the perils and pitfalls of the monarch’s many advisors: winning some, losing some, but still playing the political game. Near the end of Act IV of The Marriage of Figaro, the Count refuses to forgive Figaro for allegedly seducing his wife (actually, Susanna in disguise). When he’s finally made aware of the ruse and begins to realize the error of his ways, the Count begs forgiveness from his real spouse, the Countess Almaviva, for his lying and philandering. She pardons him in the rapturous ensemble that concludes the piece. Ah, but in Don Giovanni, the tables are turned. This time, it is Donna Elvira who crashes Giovanni’s party and begs him to change his wicked ways. The Don blatantly mocks her sincere attempts at saving his soul. Frustrated, Elvira leaves. However, as she exits a terrified Elvira comes face to face with the living statue of the murdered Commendatore, who enters Giovanni’s banquet hall as the harbinger of death. It’s the Stone Guest’s turn to seek vengeance for Giovanni’s misdeeds, to force him to make amends, but the Don refuses to bend (much as Count Almaviva did). Leporello entreats his master to repent of his sins, but Giovanni remains true to his raffish self. 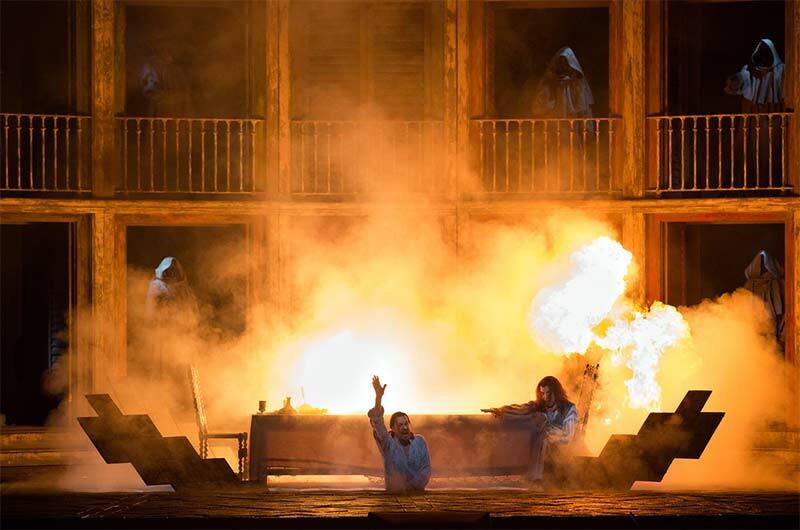 He hurls a definitive “No!” in the face of death and is ultimately dragged down to hell in the fiery finish that concludes the opera proper. In the Epilogue that follows, Leporello expresses his longstanding desire to find a more deserving master. He joins the other victims of the Don’s amorous escapades in a final contemplation of his fate: “Questo è il fin di chi fa mal” (“So ends the life of he who does wrong”). More than the moral to the story, it’s Mozart having the last laugh at the expense of the ruling class. There is no Epilogue in The Marriage of Figaro, however, except historically. We, the listening audience, are fully aware that the French Revolution was just around the corner; it would wipe away the conceits of the aristocracy in a whirlwind of savagery and bloodletting. Whew! Did we say these operas were comic or tragic? 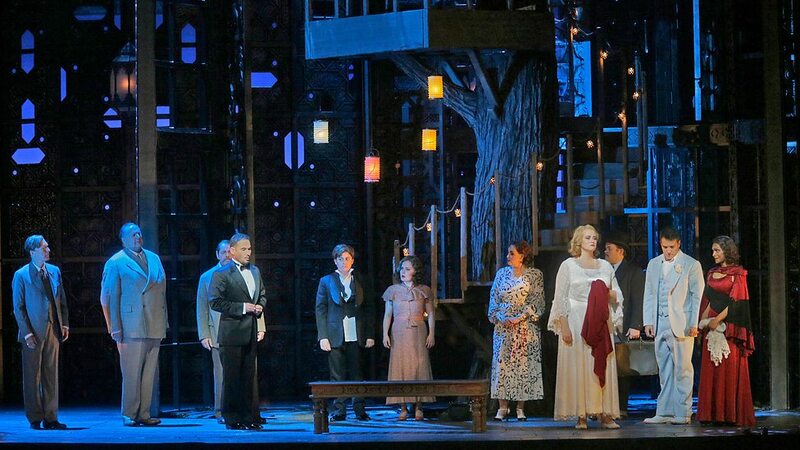 The cast of the broadcast of Figaro was different from that of the premiere. If anything, the individual members worked diligently to form a vocally and dramatically unifying whole. This is a long opera by any measure; to be honest, one of Mozart’s longest and busiest. As depicted in the Milos Forman movie Amadeus, Mozart gave us four hours of music, when it’s so difficult to concentrate for just one (I’m paraphrasing). With that said, a worthy cast is still worthy of mention: bass-baritone Erwin Schrott sang a forthright and robust Figaro, soprano Danielle De Niese was a charming and coquettish Susanna, soprano Rachel Willis-Sørensen made the Countess’ solos that much more poignant, baritone Mariusz Kwiecien was a marvelously blustery Count, mezzo-soprano Serena Malfi sang securely in the trouser role of Cherubino (or “Little Cherub”), bass-baritone John Del Carlo played a lively Dr. Bartolo, with mezzo Susanne Mentzer as the elderly Marcelina, tenor Alan Oke as an oily Don Basilio, bass Philip Cokorinos as Antonio, soprano Ashely Emerson as Barbarina, and tenor Scott Scully as Don Curzio. The orchestra was conducted by Edo de Waart, who tended toward the speedy side of things. As a former music director of the Amsterdam Concertgebouw Orchestra, De Waart kept the musicians in check, but his tendency to rush sometimes left the singers lagging behind a beat or two. 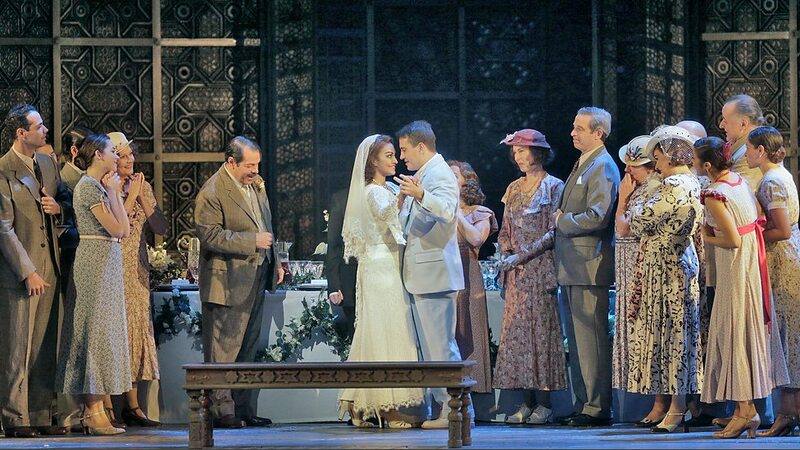 The opera’s revolving set reminded one of the BBC’s Downton Abbey, or even better, of Thames’ Upstairs Downstairs from a previous generation — not a bad concept in theory, but it left much to be desired in practice. For Don Giovanni, bass-baritone Luca Pisaroni was an Italianate Leporello of lively comical presence, soprano Elza Van Den Heever (making her radio broadcast debut) lent an air of authority to Donna Anna’s music, baritone Peter Mattei was a fearsomely resolute Don Giovanni, while basso James Morris tried valiantly to cope with the Commendatore’s music without resorting to the wobbles; in addition to the above, we had tenor Dmitry Korchak’s elegantly delivered Don Ottavio, soprano Emma Bell’s heartfelt Donna Elvira, mezzo-soprano Kate Lindsey’s feisty Zerlina, and bass-baritone Adam Plachetka’s cowering Masetto to savor over. The conductor for this performance was the New York Philharmonic’s Alan Gilbert who, like Edo de Waart, rushed his tempos mercilessly in a too-fast-reading of this precious work. The three-tiered set that dominated the proceedings has been used for many a “new” production, from Britten’s Peter Grimes to that atrocious Doctor Atomic-style Faust of a few years back. Can some novel director please dispense with the utilitarian tiers for now? It grows more and more tiresome with every performance. It’s time to put the concept to rest, or better yet, into permanent storage.